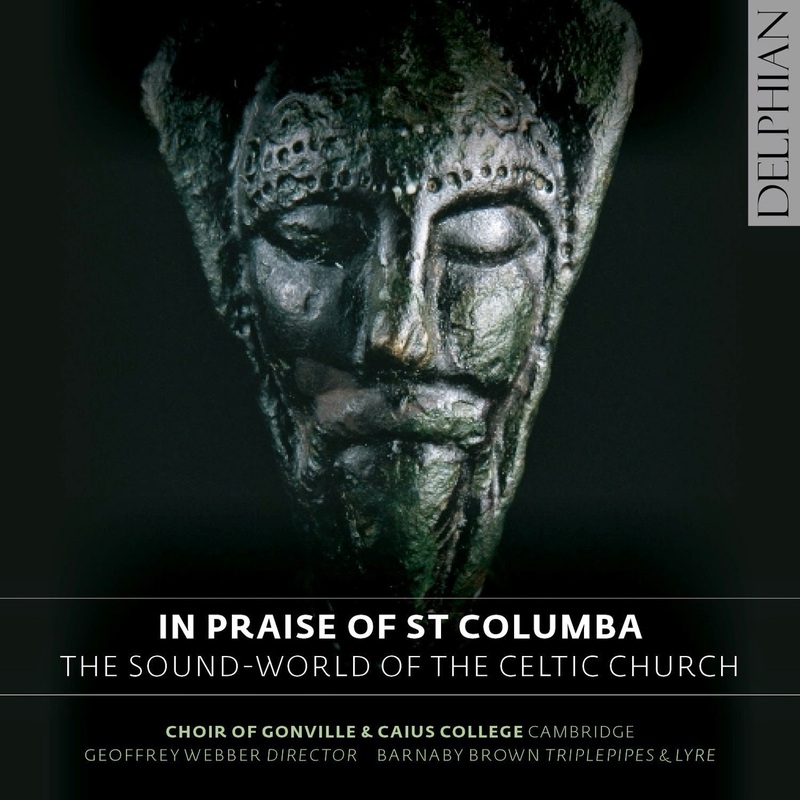 On this fascinating new disc on Delphian, Geoffrey Webber and the Choir of Gonville and Caius College, Cambridge are joined by the scholar and Barnaby Brown to explore the sound world of early Celtic church. The disc isn't so much of a reconstruction as an exploration, looking at the surviving material and trying different sound worlds. The music is all associated with Saint Columba comes from a number of major sources, the antiphons for the Feast of St. Columba come from a manuscript which may have originated on the island of Inchcolm, the mass propers come from the abbeys of St Gall and Einsiedeln which were founded by Irish monks, and the hymns have texts which were written on Iona itself. The disc starts with Os mutorum, lux cecorum from the Office of St Columba in the Inchcolm Antiphoner. The men of the choir sing chant fluidly and fluently accompanied by a drone from a reconstruction of a Celtic triple pipe played by Barnaby Brown, who also provides an instrumental prelude and postlude. It is a fascinating and evocative sound world, the combination of chant and pipe. The pipe is a reconstruction based on surviving images from manuscripts and carvings. Next comes one of the propers from Einsiedeln. All the music on the disc from Einsiedeln and St Gall uses a mixture of solo voices and tutti, which allows for far greater virtuosity in the music. Loquebar de testimoniis tuis is sung by women's voices with a lovely poised solo from Catharine Bauman. There follows another glimpse into the early sound world, an improvised duet with Malachy Frame and Simon O'Dwyer performing on modern reconstructions of a horn found during archaeological investigations in the River Erne in County Fermanagh. It is an amazing primitive sound, the music is slow moving and rather thrilling. The men's voices then sing Adiutor laborantium an alphabetic hymn with a text attributed to Saint Columba, here sung to a melody from Lausanne (chosen simply because it fits) and with polyphony following 12th century treatises and Georgian tradition. As I said at the beginning, the disc is more of an exploration than anything else and different pieces are given different treatments. The men here get to sing some lovely twiddly bits which, for me, evoked James MacMillan in Celtic mode, along with some stirring organum. Another piece from the Inchcolm Antiphoner, Sanctorum piisime Columba is accompanied by triple pipe in a highly effective combination. Then the upper voices sing an Alleluia, from Einsiedeln Lauda anima mea Dominum with a lovely virtuosic solo from counter-tenor Edward Button. We return to Iona for Noli Pater with music by Barnaby Brown after Gaelic psalm singing. The results are quite elaborate, and effectively sung by Susanna Bagnall and Catharine Bauman. This is followed by the antiphon Carne solutus pater Columba from Inchcolm, sung by upper voices in a fluently flowing manner with a pipe drone, and there are some lovely virtuosic moments. There then follows a pair of propers, a Communion from Einsideln, Amen dico vobis and a Gradual from St. Gallen Liberasti nos Domine. The first sung by lower voices, the second by the whole choir and again there are some lovely virtuoso moments with solos from Philip Kennedy and John Gowers. Cantemus in omni die is a text from Iona set to a tune from Santiago di Compostela. Accompanied by bodhran, crotal and pipe, the upper voices give us a lovely dancing piece. Still in Iona, the alphabetic hymn Altus prosator is the longest piece on the disc. Alphabetic because each verse starts with a letter of the alphabet, from A to Z. The music is by Barnaby Brown inspired by both Hebridean and Welsh traditions. It is highly repetitive, and the music is alternated between upper and lower voices with solos from Edward Button, Imogen Gardam, Malachy Frame and Stephen Fort, all accompanied by the reconstruction of a medieval lyre. The results are completely hypnotic and when towards the end the horns join in, then the results are supremely remarkable. The final selection from the Office of St. Columba from Inchcolm is Volens Ihesus linire sung by the upper voices with a fine solo from Katie Braithwate plus some virtuosic pipe playing from Barnaby Brown. We return to Gaelic psalm singing for Laudate Sominum with solos from Philip Kennedy and James Robinson, the two voices intertwining evocatively. The final piece on the disc is Barnaby Brown's own instrumental solo The Desperate Battle of the Birds on the triple pipe. This is a wonderful and evocative disc which helps us to explore what the Celtic church might have sounded like. Barnaby Brown, Geoffrey Webber and the choir have explored what is possible and given us some imaginative reconstructions, but more importantly all the pieces on the disc live as fine, vibrant performances.